This is a first in a series of brief articles on late medieval western liturgical dress and vestments. It is intended to provide a brief introduction to the terminology used to describe medieval vestments, for those who are unfamiliar with them. My intention is to provide a guide that will help fellow art historians describe what they are seeing when they look and interpret images of late medieval worship. Of course, I say that what I am describing here is the late medieval liturgical dress, but it is still what I wear Sunday by Sunday (as shown in the image above); so what I am describing here is very much a living and continuing tradition. In this the first of the series of articles, I want to begin by describing the vestments worn for the celebration of the Mass, or Eucharist and I’m going to start by looking at the base layers worn under all the other vestments: the cassock, amice, alb and its apparels. 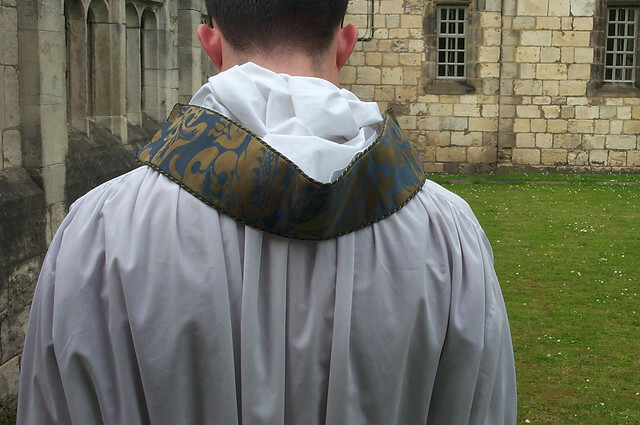 All Clerks in Holy Orders wore the same basic undergarment: the cassock. This is a long-sleeved, skirted gown of wool or other stuff, buttoned at the shoulders and waist or down the centre. It was worn as the daily dress of clerics, worn as they went about their daily business and it was worn under all the other garments. It seemingly varied in colour and although predominately black, cassocks in scarlet, green or blue were not unknown. The clerk in holy orders would arrive for the Mass in their cassock and would begin to vest. Before anything else was put on, he would don a garment called the amice. This is a rectangular piece of linen that is wrapped around the neck and held in place cords or ties secured around the torso. The name amice tells you what this garment does, it derives from the Latin amicio, which means ‘to wrap around’ and its purpose was to keep the richer garments put on later, from the grease and sweat of the neck and the back of the head. 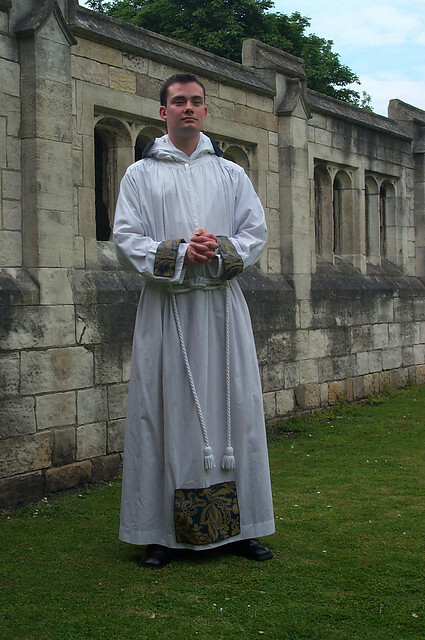 Over the cassock and amice and under all the other vestments, the clerk would wear a white garment called an alb. The name alb from the Latin albus, simply refers to its colour, the alb is white. The alb has no mystical origin and is a garment that originated as part of the ordinary dress of the Roman Empire. Roman citizens and slaves alike wore as an undergarment a white knee-length tunic, which was girded at the waist and other garments such as the Toga, the Paenula or the Planeta were worn over it. By the early fourth century, a fashion developed among the social elite of wearing a longer version of this tunic – this garment influenced by the exotic fashions of the near east was called the Tunica Talaris, Talaris meaning that the tunic reached to the ankle. In time the name Tunica Talaris was dropped in favour of the plainly descriptive term ‘alb’. After the alb had been put on, it is girded at the waist with a rope girdle or cincture and then the amice is thrown back from the head to rest neatly around the neck. These are perhaps the most misunderstood element of the liturgical undergarments. In the Middle Ages, both the alb and amice were decorated with five coloured panels called apparels. On the alb, the apparels were suspended or tacked on to the front and back hem of the skirt and on the cuffs of both sleeves. 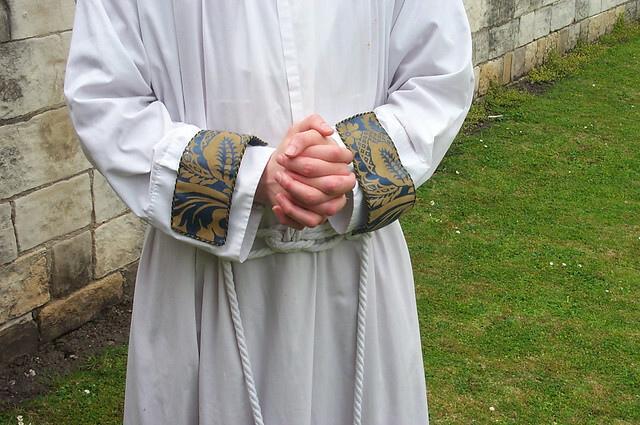 On the amice, the apparel is tacked on to the outside edge, so that, when the amice is thrown back from the head, the apparel creates a sort of collar that provides a decorative flourish. Apparels have no mystical or spiritual significance whatsoever and it seems that the sole purpose of them was to provide additional colour and decoration. 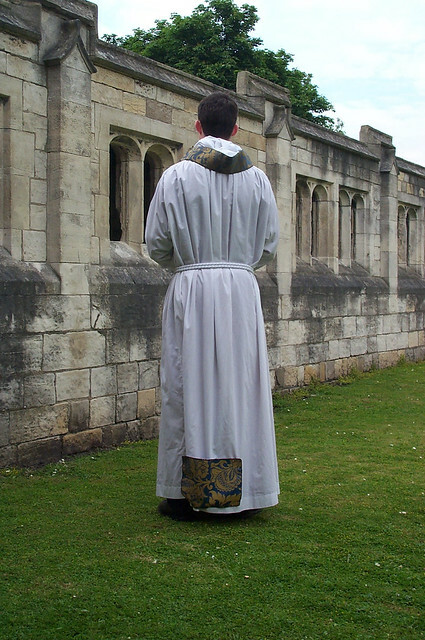 The medieval eye loved counterchange: sometimes apparels matched the main vestments, but sometimes were of a colour that contrasted with the principle vestments that were worn over the alb to give a richness of effect. The apparels might be constructed of a figured damask or brocade (as in the examples I have used above), but on occasion, they might be embroidered too. The V & A have a superb set of Apparels dating from the 1330s: a complete and two fragmentary apparels that are worked in silver, silver-gilt and silk thread on red velvet. These extraordinary examples of carefully worked ‘Opus Anglicanum’, demonstrate in their quality and the effort that went into them, just how important and integral the apparels were to the medieval liturgical aesthetic. These three base layers: cassock, amice and alb, with apparels, were worn by all clerks taking part in the liturgical action at the altar, during Mass. On top of them were worn other vestments that denoted the particular role a clerk had in the liturgy. These overgarments worn at Mass will be the focus of the second post in this series.